James McDonald is an unashamedly huge fan of classy grey D’Argento. 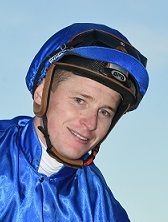 Jockey James McDonald (Pic: Steve Hart). And it all stems from a rumble the Epsom Handicap favourite had with Winx last month when McDonald wasn’t able to do him justice after being forced to race wide throughout. That was in the Group 1 Winx Stakes and the jockey is still in awe of the star quality he showed in boxing on for third behind the untouchable champ. “That was some run that day, that’s what really got my attention about how good he is,’’ McDonald said. McDonald has done a lot of work on the four-year-old throughout this preparation with Hugh Bowman committed to riding Winx in gallops and trials on the same days. And ahead of the Group 1 $1m TAB Epsom Handicap (1600m) McDonald said D’Argento has continued to improve and is on track to record his second Group 1 win after last season's Rosehill Guineas. Since that Winx Stakes run, D’Argento ran second behind Home Of The Brave in the Group 2 Theo Marks Stakes (1300m) where Punters Intel data shows he ran 35.46 (third quickest) for his last 600m despite being outsprinted in the last 200m. “That was on a track that didn’t suit him and he was dropping in distance which wasn’t ideal,’’ McDonald said. D’Argento is one of seven runners for Waller, who won three successive Epsoms between 2013 and 2015, and came up with the coveted inside gate at Tuesday’s barrier draw. McDonald, who won the 2016 Epsom on Hauraki, said he’ll happily take barrier one as it makes his job that little bit easier. “If he drew wide you’d be dictated to but from one you can be neutral and just worry about the second half,’’ he said. D’Argento was the $4 Epsom favourite with TAB following the draw ahead of stablemate Unforgotten ($4.50) who also drew favourably in three and Pierata ($5), who jumps alongside the mare, is the only other runner under double figures. Gai Waterhouse is chasing her eighth Epsom, the last was Fat Al in 2012, and first with co-trainer Adrian Bott, with Bill Ritchie winner Siege Of Quebec ($11) and Doncaster placegetter Arbeitsam ($26). Only one horse has taken the Bill Ritchie-Epsom double (Boban in 2013) in the last 30 years but Bott said with 50kg on his back Siege Of Quebec won’t die wondering. “He’s going into the race full of confidence, he has a wide draw but he has the tactical speed to put himself there and a nice light weight so we’ll look to take advatnge,’’ Bott said. Arbeitsam led and battled away to run fourth behind Noire in the Shannon Stakes (1500m) last Saturday. “He’s had a couple of quick backups, it may see like a strange campaign but for him it suits,’’ Bott said.